We are a small group situated in Geelong Victoria. Day trips most Sundays and bush camps long weekends. Come and join the cammeradery of like minded people. Not sure whether this club is operating, it is up to the individual clubs to maintain their listing. Hi Bob, my father used to do a lot of Gold detecting, and misses going. I wondered what the set up was and how i go about finding out more. He lives on his own and I thought it would be good company for him. Do you still run day trips? He used to have all the equipment but has since sold it all. Does he need to provide his own? Could you please give me a contact nbr to enquire? Hi Bob i was thinking of going down to Geelong for a holiday and a swing with your club, when my missus visit her mum in Geelong. i did join your club several years ago. and we went out to Meridith for a swing. it was my first time and i enjoyed it . I have bought a GPZ 7000 and yet to find my first piece of gold. 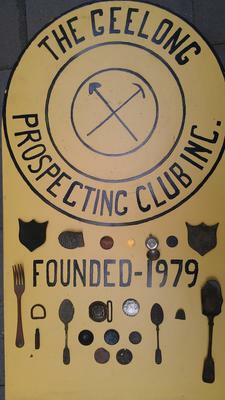 I live in Geelong and would like to join the Geelong Prospection Club. How can I join. Have tried the link to your website but have not been able to visit your site. Can you give me an email address or contact number to call. I am interested in searching for Gold... and am in a wheel chair. Would it be possible for me to join in one week end? I have a piece of gold at home that i found with my metal detector.It weights 22.4grams and wanted to know how much it is worth.